to silently and safely authenticate customers without friction. ATLANTA, April 25, 2017 – IDology, a leader in multi-layered identity verification and fraud prevention, today announced the addition of two innovative digital authentication solutions, ExpectID® Mobile Authentication and ExpectID® Secure One-Time Verify, to its fully integrated platform. The new solutions are designed to help companies increase customer success in the digital environment and securely authenticate new and existing customers, while eliminating factors that negatively impact the customer experience. IDology’s new Digital Authentication solutions monitor and account for all types of digital fraud and high-frequency mobile change events such as SIM cloning, SIM swapping and recycled phone numbers. Information is captured and provided automatically in real-time, enabling businesses to easily determine the safety of an interaction and make an educated decision on whether or not to escalate it to another authentication method. IDology’s comprehensive spectrum of solutions work together, giving businesses the flexibility and freedom to take quick actions to protect their business and customers. IDology’s ExpectID Mobile Authentication leverages access to real-time mobile carrier data to authenticate customers and their devices behind the scenes. Integrated into the ExpectID platform, use as a one-time application for account openings or in continuous mode for future transactions such as account logins or password resets. Analyzes dynamic, real-time account level mobile attributes for better risk intelligence. Eliminates the need for time-consuming and less effective authenticator apps or passcodes. Today, many companies authenticate customers by sending a one-time passcode (OTP) via SMS to a customer’s device and then requiring the customer input the key in order to access their account. While this type of authentication has become the standard method of protection in recent years, it requires a user to conduct the same tedious process time and again. In addition, there are concerns about security due to its potential for spoofing and interception. Uses real-time mobile carrier data to verify the mobile device. Eliminates the need for OTPs and instead sends a secure link that only requires the consumer tap it to access their account. Allows customers to access their accounts quickly, whether from a desktop computer or on a mobile device, and provides the peace of mind that two-factor authentication has occurred. IDology combines access to real-time mobile carrier data with a fully integrated SaaS platform for a multi-layered approach to digital authentication, verification and fraud prevention. In addition to IDology’s innovative solutions and focus on customer service, businesses benefit from the power of the IDology Collaborative Fraud Network and IDology Annual Fraud Report to better understand and stay one step ahead of the ever-changing fraud landscape. IDology provides real-time technology solutions that verify an individual’s identity and age for anyone conducting business in a consumer-not-present environment to help drive revenue, decrease costs, prevent fraud and meet compliance regulations. 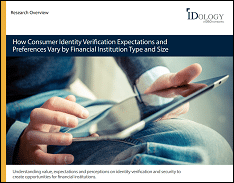 Founded in 2003, IDology offers a solution-driven approach to identity verification and fraud prevention that ultimately helps increase customer acquisition and improve the customer experience. IDology has developed an innovative and on-demand technology platform that allows customers to control the entire proofing process and provides the flexibility to make configuration changes that are deployed automatically—without having to rely on internal IT resources or IDology’s customer service so businesses can stay ahead of the fraud landscape while maintaining compliance. For more information, visit www.IDology.com or call 866-520-1234.